Stairways, Inc.'s wide variety of metal spiral staircases and wood spiral staircases areavailable both fully assembled and in kit form, Stairways Inc. offers our clients custom spiral stairs and staircases built to their specifications, even if it involves a unique blend of standard spiral stairway parts and custom diameters and sizes. For instance, Stairways Inc. can custom fabricate curved stairs, straight staircases, and custom staircases with no center column. 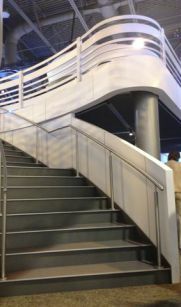 Custom staircases can be shipped fully assembled or shipped in the largest possible sections that can then be spliced together at the job site. Prospective clients and customers are invited to use our Quote Center or email your specifications or drawings for your spiral stairs or custom staircase design in .dwg or .dwf file format.